Common stock investors, savers and preferred stock investors all pursue what they feel is a reasonable return, but how they go about it and the risks involved varies substantially. The Federal Reserve's unprecedented announcement that the current interest rate environment will be with us for at least another two years has not only exaggerated those differences but, in doing so, has highlighted the appeal of high quality preferred stocks. Common stock investors make their money by investing in a common stock that appreciates in value - buy low, sell high. Figure 1 shows the results over the last 11 years and 9 months. The DJIA index of common stock values at the beginning of 2000 was 11,522. 11 years and 9 months later, on October 3, 2011 the DJIA closed at 10,861. Dividend paying common stocks returned about two percent annually over this period. With the exception of the 2003 and 2009 recoveries, common stock investors (as represented by the DJIA) have very little to show in the way of returns despite having taken considerable risks along the way. And the volatility over the last couple of months has added insult to injury to common stock investors. 200 point daily DJIA fluctuations have become the norm since early August. For the time being, the common stock market has lost equilibrium between buyers and sellers. Many have sought refuge in cash accounts, primarily bank Certificates of Deposit (CDs). But Figure 2 makes the minimal returns available to savers pretty clear. The Federal Reserve's monetary policy of keeping interest rates low has set a trap for savers. The average annual yield being offered by U.S. banks on 24-month CDs ended September 2011 at a dismal 1.29%. More bad news for savers: The short line on Figure 2 shows you the annual inflation rate (CPI) as published by the U.S. Bureau of Labor Statistics (ending August is the most recent available) over the last two years. U.S. domestic inflation is now at 3.77%. 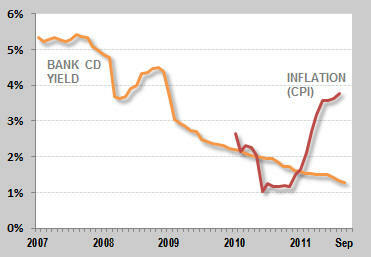 The dismal 1.29% annual gain from that bank CD is being eaten, in its entirety, three times over by inflation right now. Ouch. The highest quality preferred stocks trading on U.S. stock exchanges today are offering an average annual yield of 7.35% (ending September) at what is arguably much lower risk than many alternatives. Today's U.S. preferred stock market includes about 1,100 securities but most risk-adverse preferred stock investors stick to just the highest quality issues. 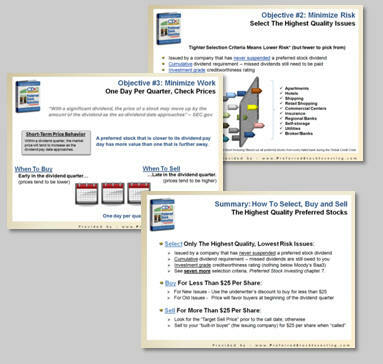 The highest quality issues have specific risk-lowering characteristics such as those that (1) are rated investment grade, (2) have the "cumulative" dividend provision (meaning that if the issuing company misses a dividend payment to you their obligation to you accumulates; they still owe you the money) and (3) are issued by a company that has a perfect track record of never having suspended a preferred stock dividend. 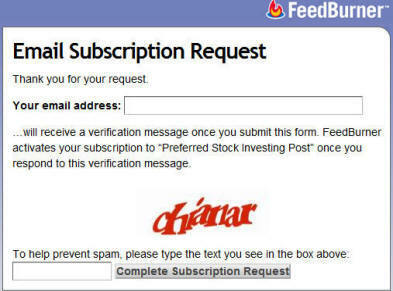 These high quality preferred stocks are listed in chapter 15 of my book, Preferred Stock Investing, and on the CDx3 Notification Service website (my preferred stock email alert and research newsletter service - take tour). Because the dividend return is known in advance, there is much less price speculation with preferred stocks. Everyone knows what the return is going to be and the exact date on which it is going to be paid to shareholders. Preferred stock market prices are more closely tied to the direction of interest rates, now declared by the Federal Reserve to remain stable until at least the middle of 2013. Consequently, high quality preferred stock market prices are less volatile than their common stock counterparts due to less speculation and are likely to stay that way for at least the next two years. When dividend pay day arrives preferred stock investors are always paid before common stock shareholders receive a dime (hence the name "preferred"). So preferred stock investors have less investment risk than their common stock counterparts. In return, preferred stock investors give up their right to vote in corporate elections. It is also important for preferred stock investors to avoid paying more than the redemption value ("par") for their shares. In the event that the issuing company retires the shares, shareholders will receive the redemption value in cash (usually $25 per share). Purchasing your shares for less than the redemption value turns this risk into an opportunity since by doing so you position yourself for a nice capital gain in the event of a call. Figure 1 illustrates the difficult 11+ years that common stock investors have faced in the stock market. And Figure 2 shows what has happened to savers over the last several years as well. Now look at Figure 3. 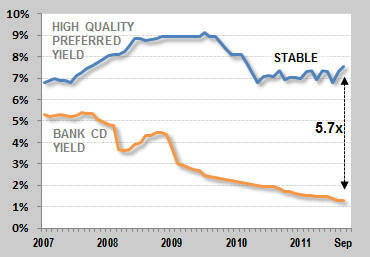 The bottom line on Figure 3 is the same bank CD yield line that we saw on Figure 2. The top line on this chart shows the average dividend yield being paid to shareholders by the highest quality preferred stocks over the same period. Currently the highest quality preferred stock issues are paying an average yield of 7.35% with less price volatility and lower risk than the common stocks issued by the same companies. At 7.35%, high quality preferred stocks are delivering almost 6 times the income as bank CDs right now. Notice how the Fed's two year old low-to-no interest rate policy stabilized preferred stock returns while decimating savers. This is the policy that the Fed has committed to continuing until at least the middle of 2013. There are currently 89 high quality preferred stocks trading on U.S. stock exchanges. All have investment grade ratings, offer cumulative dividends and a perfect tract record of no missed dividends by their issuing companies. The CDx3 Notification Service website provides the list (see sample screen). These high quality preferred stocks are offered by companies from various industry segments: big investment banks, regional banks, insurance companies, real estate outfits (such as apartments, shipping facilities, hotels, self-storage, hospitals and shopping centers) and utilities. There are also many preferred stocks from additional industries (high tech, manufacturing, airlines, communications, etc.) but issues from these industries tend to offer riskier speculative grade ratings and "non-cumulative" dividends (if the company misses a dividend payment they have no obligation to pay you back downstream). As described in the September 2011 issue of the CDx3 Newsletter, the August Federal Reserve announcement of low-to-no interest rates for at least another two years was a real gift to real estate investment trusts (REITs). A low rate environment favors REITs more directly than most other types of businesses and, by law, REITs are required to distribute at least 90% of those profits to their shareholders - that's us. Since the Big Bank Trust Preferred Stock (TRUPS) opportunity was created by the Wall Street Reform Act on July 21, 2010, every issue of the CDx3 Newsletter has allowed readers to watch the opportunity unfold in this article. On October 3, Wells Fargo retired WCO and WB-D in response to the Act, becoming the latest Big Bank to deliver on the Big Bank TRUPS opportunity first described to you here fifteen months ago. While the list of choices will generally become shorter as we get closer to January 1, 2013, those interested in getting in on the Big Bank TRUPS opportunity still have time to do so. But please note that this list, while usually having about 15 Big Bank TRUPS listed, has only five for this month (very nice yields though!). (Already a subscriber? 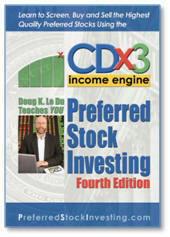 For symbols see page 7 of the October 2011 issue of the subscriber's newsletter, CDx3 Research Notes). BRE Properties, based in San Francisco, California, focuses on the development, acquisition and management of apartment communities located primarily in the major metropolitan markets of Southern and Northern California and Seattle. BRE directly owns 77 multifamily communities (totaling 21,820 units) and has joint venture interests in an additional 13 apartment communities (totaling 4,080 units). BRE Properties was founded in 1970 and is a real estate investment trust (REIT) listed in the S&P MidCap 400 Index. BRE has perfected jumping in front of someone else's parade and riding the resulting financial performance. They watch population demographic data very closely and either acquire or build apartment buildings in areas that (a) have a shortage of supply and (b) are about to realize a significant up tick in renters. "During the quarter, overall occupancies in the same-store properties were strong and availability tight, with the exception of LA and Inland Empire. For the quarter, portfolio occupancy averaged 95.7%, with availability at 6.2%. Currently, the portfolio occupancy has strengthened to 96% and 5.9% available, with Southern California at 95.8% and 5.8% available." In May the company executed a $440 million equity offering to provide new capital. And BRE closed $415 million in new acquisitions over the last 18 months. "This development activity represents total starts in 2011 of $450 million. We expect another $325 million to $350 million in starts in 2012. We expect development advances to total $75 million to $100 million for the balance of 2011. And beginning in 2012, advances should average $225 million to $275 million per year. Our pipeline represents 4 to 5 years of development activity, and most of our sites are nearly fully entitled today, removing the risk of discretionary approvals as we finalize construction plans. From a liquidity standpoint, except for our line renewal in September of 2012, we have no material debt maturities until 2017, providing us with significant financial flexibility." 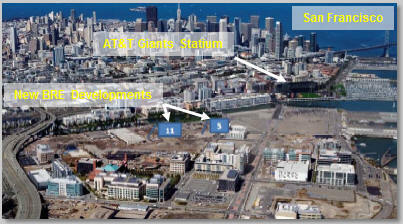 BRE's new Misson Bay, San Francisco development is an example of how the company executes its strategy. Land available for new apartment construction is in short supply. But the new Mission Bay project puts 360 new units within walking distance of the extremely popular and vital AT&T ballpark area, a major draw for young, active fans. The "Echo generation" is expected to grow 9.6% in California, compared to 4% for the nation as a whole. 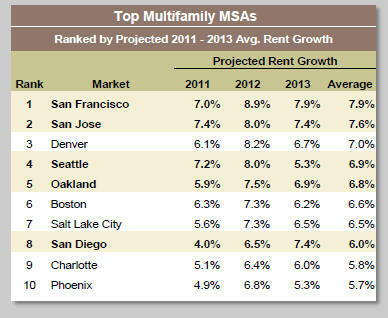 "The Bay Area and Seattle markets are strong and getting stronger. New leases and renewals were signed during the quarter at an increase of 7.2%, or $100 per lease. We expect that the pace of increase should continue to accelerate in the back half of the year." REITs make the bulk of their profit from the spread between the cost of capital for properties and the return generated by the rents paid by the property's tenants. REITs in general, and BRE in particular, should therefore benefit from the commitment to low interest rates made by the Federal Reserve in August. Learn more about BRE: Company website | Profile | Upgrades/Downgrades | Recent News. This question is particularly important this month since it is at the heart of the opportunity that section 151 of the Wall Street Reform Act creates for preferred stock investors. When a new preferred stock is introduced to the marketplace it typically has a five year "call date." The call date is when the issuing company of a preferred stock regains the right to buy your shares back from you (although there are a small number of exceptions that allow a premature call). Until the security is called, the issuing company is obligated to pay dividends to you every quarter. The call date introduces several benefits for preferred stock investors. You know in advance what your dividend income is going to be at least until the security is called. Plus, for fixed-rate preferred stocks, if rates go down the issuing company is stuck with paying you the higher rate that your preferred stock carries (called the "coupon rate"). But this cuts both ways of course; if rates go up, the dividend income that you receive from a fixed-rate preferred stock does not change. Another advantage to preferred stock investors is that when a company calls (buys back from you) a preferred stock issue, they pay all of the then-current shareholders a fixed price per share that is known in advance. That means that if you can purchase your shares for less than this amount, you stand to make a capital gain on top of the dividend income that you've been earning in the meantime in the event of a call. Since section 171 of the Wall Street Reform Act (by reference) disallows Trust Preferred Stocks (one of the three types of preferred stocks, see Preferred Stock Investing chapter 2) from being included in the capital reserves that Big Banks have to keep on hand (as measured by the Tier 1 Capital calculation), it is extremely likely that these banks are going to be calling their Trust Preferred Stocks as soon as possible (paying all holders $25 per share). Comerica, Fifth Third, KeyCorp and Wells Fargo have already done so. 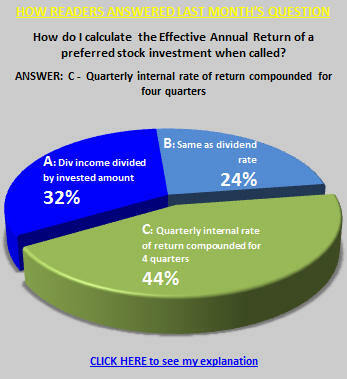 Knowing that (1) you are going to receive $25.00 per share in the event of a call, (2) a call is extremely likely, (3) which specific preferred stocks are going to be involved and (4) the exact date that those preferred stocks will become callable, provides a very unique opportunity that preferred stock investors should consider, especially since many of these targeted Trust Preferred Stocks are currently providing annual dividend yields of about 7%. Is there anyone left who is not suing Bank of America over the activities of its Countrywide group? What a mess. No one knows what action, if any, BofA is going to take to ease the pain but if the troubled bank is going to make a move it is likely to happen sooner rather than later. There are so many conflicting SEC filings, company statements and press reports regarding Bank of America that it has become impossible for preferred stock investors (or anyone else) to evaluate their risk with respect to the mishmash of its securities. Prior to the Global Credit Crisis, BofA's former CEO, Ken Lewis pursued an aggressive growth through acquisition strategy, buying anything with the word "bank" on its letterhead. For preferred stock investors, that led to a confusing constellation of preferred stocks, owned by BofA but without BofA trading symbols. While the common stock of the acquired company folds under the common stock trading symbol of those doing the acquiring (BAC), that is generally not the case with outstanding preferred stock issues (AMB's acquisition of ProLogis earlier this year was an exception where the merged firm has continued business under the ProLogis name and changed all outstanding AMB preferred trading symbols to start with PLD). BAC, KRB, FBF, MER and CFC. If you own, or are considering owning, shares of preferred stocks that have trading symbols beginning with any of the above three letters, you are looking at a BofA preferred stock. Here's another tip: There are three types of preferred stocks - traditional, trust and third-party trust (see Preferred Stock Investing, chapter 2 "Creating A New Preferred Stock"). While rare, there are third-party trust preferred stocks that, while not issued by Bank of America, are secured using Bank of America securities. What that means is that even though you may own shares of a third-party trust preferred stock issued by, say, Morgan Stanley, your risk is actually tied directly to the greatness, or lack thereof, of Bank of America. 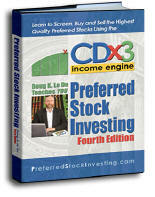 One such third-party trust preferred stock is identified and discussed in the current (October 2011) issue of the CDx3 Notification Service newsletter, CDx3 Research Notes. For readers of my book, Preferred Stock Investing, this security also appears in the preferred stock list on page 229 as item number 8.